As many are aware, an outbreak of Legionnaire’s disease has occurred at our very own Illinois Veterans’ Home in Quincy. Forty-five people associated with the home have tested positive for the disease, and this includes residents (41) and staff (4). Sadly we have lost seven residents to the terrible outbreak. Specialists from the U.S. Centers for Disease Control are on-site in Quincy, and I have been assured that the disease is being closely monitored by staff at the Illinois Veterans’ Home, and by officials of the Illinois Department of Public Health. Please keep everyone at the Illinois Veterans’ Home in your best wishes. Illinois House honors Lt. Charles Joseph “G.I. Joe” Gliniewicz. The Fox Lake Police lieutenant was murdered on the morning of Tuesday, September 1. Gliniewicz and his family were praised on Wednesday, September 2 by House Republican members John Anthony and John Cabello, who are retired police officers themselves. The Illinois House was silent as Rep. Anthony, who had been personally acquainted with Gliniewicz, told the body that the veteran of 30 years’ service in law enforcement had been looking forward to retirement with his family. Rep. Barb Wheeler, who represents Fox Lake, told the House of the lieutenant’s long service to his community. Since October 1990, the Illinois Capitol has cooperated with the Illinois Police Officers Memorial Committee to honor fallen police officers from forces throughout Illinois. The memorial, which stands on the southwest corner of the Capitol in Springfield, is visited by officers, troopers, police veterans, and families throughout the State. All law enforcement officers who have given their lives while in the performance of their duty are eligible to be honored by name at this memorial. Visitation peaks at the annual Police Memorial Ceremony, traditionally held on the first or second Thursday in May. The ceremony individually recognizes each addition to the engraved list of the names of the fallen. House Republicans defend fair bargaining process for state employees & taxpayers. On Wednesday, House Republicans blocked an attempt by the Democrat majority to override Governor Rauner’s veto of SB 1229. The bill would have changed the way that the State of Illinois negotiates with labor unions in cases of alleged negotiation impasses. The measure would have instituted “interest arbitration” as the preferred method, for four years, for the State of Illinois to negotiate with most of its organized workers. The bill was seen as a pathway for the State’s largest union, AFSCME, to bypass the collective bargaining process and use interest arbitration to impose a labor-management contract on the State. AFSCME’s contract offer, which could have been adopted in its entirety under interest arbitration, could have resulted in an increase of $1.5 billion to $2.0 billion in taxpayer-funded employment costs over the next four years. SB 1229 is bad public policy aimed directly at Governor Rauner. The Governor has committed in writing that the tolling agreement extending the current contract will remain in place until both sides agree they are walking away from the negotiating table. The Governor will not lock out employees and is committed to remaining at the table until a final deal is reached. He cannot and will not force unions to strike. The Democrats’ proposal would take away negotiating authority from the duly elected Governor and put state labor contracts in the hands of an arbitrator, not elected or accountable to taxpayers, who would not be allowed to compromise or come up with a reasonable solution. Whereas normally arbitrators are given discretion to forge a compromise, that would no longer be the case (at least not for the current administration). Arbitrators would be forced to choose between labor’s request or the State’s proposal with absolutely no discretion… all or nothing. 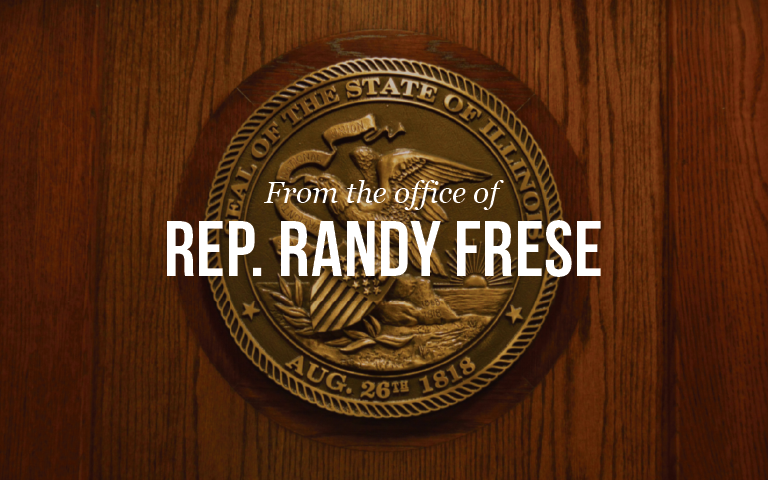 After a total veto by Governor Rauner, SB 1229 was returned to the General Assembly for a possible override as provided for in the state Constitution. To override the Governor’s veto requires a three-fifths vote in both houses of the legislature. While the Senate voted to override the Governor’s veto, the Illinois House voted on Wednesday, September 2 to sustain Governor Rauner’s veto, thereby defeating the bill (71 votes had been required). The House vote was 68-34-9. Moody’s warns of consequences if budget stalemate not resolved. The global bond rating service, which has imposed several cuts on the debt status of Illinois, warned the State of potential further downgrades in a report published on Monday, August 31. The report called attention to the current budget impasse of the State of Illinois, which is attempting to operate without a legally enacted spending plan for fiscal year 2016. FY16 began on July 1, 2015. Changes in the debt rating of Illinois as a whole, and of subsidiaries (such as the University of Illinois) affect interest rates that must be paid by Illinois taxpayers. Rating agencies such as Moody’s, Standard & Poor’s, and Fitch Ratings have given Illinois the lowest debt rating of any U.S. state. Commission on Government Forecasting and Accountability (CGFA) issues monthly budget report. The CGFA report, issued by the General Assembly’s nonpartisan budget office, covers revenue and spending trends in August 2015. CGFA tracks changes in State revenues, particularly income and sales tax payments, and projects them out for the remainder of FY16. Changes in State revenues currently reflect two major factors: (a) the drop in State personal and corporate income tax rates that took effect on January 1, 2015; and (b) continued slow growth in the overall U.S. economy. CGFA has tracked changes in United States gross domestic product in the first half of calendar 2015, and continues to see overall growth rates trending in the band of 2.0% – 2.5%. New tax revenue is not growing as fast as the cost of expenses mandated upon the public sector of the State, and is not growing fast enough to replace the revenues lost through the January 2015 income tax rate rollback. CGFA spreadsheets detail the current fiscal situation. In August 2015, for example, total State general funds revenues fell $194 million short of previous-year revenues. In August 2014, the State took in $2.38 billion in overall general funds revenues; during the same 31-day period one year later, $2.19 billion came in. Disability service providers said to have been paid through August; some providers say money not yet received. In compliance with a court order issued by federal judge Sharon Coleman, the State indicated it has paid $120 million to disability service providers. The payment was reported on Friday, August 28. The creditors, licensed networks of services (particularly residential services) to persons with developmental disabilities, sought up-to-date payments under the “Ligas” consent decree. Some creditors reported this week that they have not yet received these reported payments. Comptroller Leslie Munger has the duty of balancing money coming in with payments going out. The July-August payments to disability service providers followed a warning in the previous week that because of the State’s current budget impasse, the required funds would not be immediately available. City Hall sues Redflex Traffic Systems for bribing its own top officials. The lawsuit, which claims more than $300 million in damages, was filed on Monday, August 31. It follows a guilty plea by Karen Finley, the former CEO of Redflex, on charges of passing bribes to key former city officials. In return for the bribes, the former officials allegedly awarded a lucrative contract to Redflex to operate the automated cameras. The Chicago red-light camera system has been controversial since its startup in 2003. In areas within Chicago, yellow traffic light warning intervals are down to 3.0 seconds in length; when the traffic light turns red, any motor vehicle within the intersection can be photographed and a fine notice issued. In addition to red-light cameras, speed cameras have been installed in Chicago parks and school speed zones. More than $500 million in traffic fines have been raised from allegedly guilty motorists. Under the Chicago/Redflex contract, proceeds from these fines were split between the city and Redflex. Redflex is said to have taken in approximately $124 million as their share of fine revenues from the controversial program when they helped to control it during the ten-year 2003-2013 period. At the program’s peak, more than 380 Redflex cameras were installed throughout Chicago. The city of Chicago has severed its relationship with Redflex, but the controversial camera program has not gone away; re-installed cameras are now operated by a subsidiary of the Xerox Corporation, Xerox Photo Enforcement Systems, which has duplicated many of the enforcement policies originated by Chicago and Redflex in 2003. House moves forward on heroin crisis; bill passed over Governor’s veto. HB 1, which was drafted with the active participation of law enforcement, contains numerous changes to State and local programs aimed at heroin and other opiate drugs. The bill strengthens the Prescription Drug Monitoring Program, creates a program to move towards universal availability of heroin-overdose-reversal medications (opioid antagonists) in the hands of first responders and in the formularies of health insurance policies, enhances criminal penalties for “prescription shopping,” expands Medicaid to cover opioid dependence medications and opioid antagonists, and makes other changes. The bill was drafted by the House Bipartisan Heroin Crisis Task Force, a special House committee that held many hearings on opiate drugs and opiate addiction issues. The Task Force heard emotional testimony from the families of loved ones who had overdosed on opiate drugs. After the bill was sent to the Governor’s desk for final action, Gov. Rauner wrote an amendatory veto to remove sections of the bill that had implications for the State’s budget and taxpayers. The amendatory veto would have reduced costs to the Medicaid program by removing medication-assistant treatment for alcohol or opioid dependence, and cutting out opioid antagonists. Some budget experts saw the Governor’s amendatory veto as a reasonable response to the State’s budget crisis. However, Speaker Madigan made it clear that the amendatory veto motion would not be called and that the House would have to cast an up-or-down vote on the original bill as passed by both houses of the General Assembly. The House voted 105-5-0 to override the Governor’s veto on Wednesday, September 2. The measure now moves to the Illinois Senate for another override vote and possible final action. Illinois to test pilot program to place locking devices on prescription vials. The pilot program is aimed at vials containing Schedule II controlled substances. These include opiate medications such as hydrocodone, found in widely-prescribed painkillers such as Vicodin. Strong analgesics are blamed for widespread growth among some Americans in opiate tolerance, which can progress in some cases to drug addiction. The pilot program was announced on Saturday, August 29 by Gov. Bruce Rauner. Under the program, a vial containing prescription medication is transferred with a special cap containing a four-digit combination lock. Dialing in the proper combination will be necessary before the vial cap can be unsealed and the vial opened. This will be a pilot program for one year, and only certain participating pharmacies will dispense eligible drugs in combination-sealed vials. The pilot program is scheduled to begin on January 1, 2016. It will be operated by the Department of Financial and Professional Regulation as part of its overall regulation of the pharmaceutical professions. The bill to create this program, HB 3219, became law through Governor Rauner’s signature on Thursday, August 27. Lead co-sponsors included House Republican Reps. Michael McAuliffe and Christine Winger. In confirmation of Republicans’ concerns, website thumbtack.com gives Illinois’ business climate a grade of “F” for 2015. The failing grade was the result of Thumbtack’s Small Business Friendliness Survey of nearly 18,000 small business owners nationwide. Survey results paralleled concerns raised by House Republicans about Illinois’ job-creation atmosphere and business climate. Thumbtack respondents also gave failing grades to California, Connecticut, and Rhode Island. Thumbtack’s survey asked respondents to comment on ten separate criteria, which were aggregated to generate a final total. The variables included ease of starting a business, ease of hiring, regulations, health and safety, employment/labor and hiring, tax code, licensing mandates, environmental regulations, zoning, and training-and-networking programs. Surveyed small businesspeople gave above-average grades to three of Illinois’ neighboring states: Indiana, Missouri and Wisconsin. Mondelez International to lay off 600 workers at historic South Side factory. The workforce reduction, which will affect about one-half of the Chicago plant’s workers, is associated with the firm’s decision to move a substantial share of its cookie and cracker production to another facility in Mexico. The Kedzie Avenue plant, with 1.8 million square feet of production space, was once the world’s largest baking facility. Wall Street analysts described the move as a round of layoffs associated with widespread merger and acquisition (M&A) activity. The Mondelez Chicago plant was founded as the National Biscuit Company and did business under the “Nabisco” name for many decades, producing familiar packaged goods such as Oreo cookies. The Nabisco brand name and product family changed hands in 2007 and again in 2012. Significant decline in gas prices in Chicago area. The price movement followed restoration of operations at a distillation unit within the BP plc refinery in Whiting, Indiana. The Gary-area refinery, the largest in the Chicago area, specializes in the production of federally-mandated metropolitan Chicago motor fuel. The specialty fuel is blended in such as a way as to reduce further increases in ozone levels throughout a ten-county area. The mapped area within this zone, a so-called “noncompliance” zone, has air that has been measured to repeatedly contain percentages of ozone pollution that exceed federal guidelines. Gas prices spiked throughout the Chicago area and northwest Indiana following shutdown of the BP distillation unit in mid-August. Restoration of distillation operations led to the retail price of motor fuel dropping an average of 28.7 cents during the week of August 23 through August 30. Lack of budget means lottery winners will have to wait for payment. The Illinois State Lottery announced on Friday, August 28 that, in the absence of new appropriation authority, their cash began running short on July 1 and they are no longer able to pay out cash prizes of $25,000 or more in FY16. During the opening months of the 2016 fiscal year the Lottery is giving scrip warrants to Illinois winners, which they will be authorized to turn in for cash when the money becomes available. While many State cash flows are protected by judicial decree or court order, this does not apply to proceeds from gaming and gaming taxes. Lottery winners, the home communities where video games are played, and the “dockside communities” where licensed casino barges offer their games are three categories of recipients who are being told to await future payments. Lottery players who win smaller prizes are continuing to receive payouts. Prizes of $600 or less can be cashed in at retailers. Prizes from $601 to $25,000 are being redeemed at Illinois State Lottery claims centers; the centers are listed here. More than 100 cases reported at the University of Illinois at Urbana-Champaign (UIUC). The highly contagious disease, close to eradication in recent years due to widespread vaccinations, has broken out again in several locations throughout the U.S. The disease is being tracked in Champaign County, home of Illinois’ flagship university. The Illinois Department of Public Health reported on Friday, August 28 that 105 cases had been diagnosed in the UIUC community. A key symptom used by physicians to diagnose mumps is swelling of the salivary glands, with the parotid gland at the base of the jawline especially affected. Physicians advise persons with swollen jaws, puffy cheeks, severe fever, headache, muscle aches and loss of appetite to contact a medical professional by phone in order to be screened for possible diagnosis of the contagious viral disease. College and university campuses are potential vector locations for the transmission of mumps and other viral illnesses. A recent drop in the percentage of persons vaccinated in infancy for mumps is blamed for the renewed outbreak of the disease. The University of Illinois at Urbana-Champaign is offering a free vaccination clinic for students not yet infected. Teamsters sign on to four-year labor agreement with State of Illinois. Governor Bruce Rauner announced the agreement on Monday, August 31. The contract included key concessions by both sides. 4,600 State employees are covered by the new agreement, which must be ratified by a rank-and-file vote by organized Teamsters. Key features of the new contract include a four-year wage freeze, maintenance of existing health care benefits, and a reduction in the number of unused vacation days that future new State hires in Teamster-organized work spaces will be allowed to carry over. The new State contract with the Teamsters union does not officially affect the status of State employees who are members of other labor unions, including members of AFSCME.